Some of these are our own tools and others are tools we use every day in our businesses. We have tested all of them and you won't find anything here that we do not use. Some are affiliate links others not. This is our Google My Business training which caters for all levels, be it a local business that wants to dominate in his niche, or a SEO business or agency who need to learn the secrets the gurus will never teach you. This super powerful tool allows you to power up all of your Geo Genius sites, your websites, citations, videos enormously by using the domain authority of 6 of the most powerful domains in the world. Imagine having fully SEO'ed HTML pages with any copy, images, maps, videos embedded on Google Cloud, Amazon S3, Microsoft Azure, Alibaba, Digital Ocean and P2 cloud? 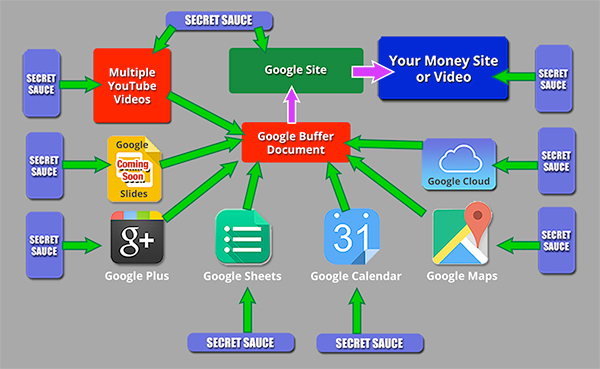 Creates, Shares Publicly, Interlinks (stacks) n the Google Sites and Properties Shown below, on autopilot. Try Content Samurai FREE for 7 Days! With the Brute Force Indexer being added to G-INDEXER users once again have the power to mass index their backlinks and parasite pages. Even though indexing with the Brute Force Indexer is not instant, having an alternative option to index your urls within a couple of minutes to an hour is still keeping you ahead of the competition. Local video marketing guru Bernardo Alves and John Currie guide you in a step by step, easy to follow manner. Highly recommended.